There was no better place to play baseball than Boston five years ago. The Red Sox performed before sellout crowds at historic Fenway Park. Fans worshipped them. Terry Francona was a players' manager. They spent absurd amounts of money on payroll. Theo Epstein was considered the game's savviest general manager. Even ownership did everything it could to ingratiate itself to the players. Rare is the organization where ivory tower and clubhouse mingle, and yet at least once a year, the entire organization, from ownership to management to players to manager, would hold a rap session in which nothing was off-limits. The gripes were almost always minor, but still. That sort of honesty, that sort of openness, simply didn't exist elsewhere. The Red Sox built such harmony on a single principle: success. Winning is the salve for hard truths. It fosters trust. As long as the Red Sox baseball machine churned on like it had with a pair of championships in 2004 and 2007, the happy meetings would continue unabated, the billionaires in suits and millionaires in uniform obliging one another in mutually beneficial lovefests. Today, of course, the entire system is broken. Red Sox players do not trust owner John Henry, chairman Tom Werner and president Larry Lucchino. They see the owners' box as a den of lies, leaks and resentment, the place where Lucchino hatched the idea to hire Bobby Valentine as manager, which has gone about as pleasantly as an enema. In late July, a gang of players sent a text message to ownership calling for a meeting to discuss Valentine's foibles. Henry and Lucchino granted them an audience July 27 on an off-day in New York. Unlike previous roundtables, the manager was not present. Players grumbled, vented and aired their grievances. Sources present at the meeting said the complaints left Henry and Lucchino aghast. They were certain change would come. And, if Henry stands by his words, it won't. After visiting with Valentine for breakfast Monday morning in Seattle, Henry told the Boston Herald the Red Sox were "resolute" in standing by Valentine for at least the remainder of the season. Henry joined the Red Sox to take their pulse, intent on speaking with a number of players and trying to understand how his $173 million team devolved into one of the 10 worst in the game. Of the ownership group, Henry has long earned the most respect from players because he is a self-made billionaire who cavorts on yachts and carries himself with a charming air of nerd-made-good. Still, he is deluding himself if he believes a couple of conversations are going to provide clarity on what ails his baseball team. As long as Bobby Valentine remains manager of the Boston Red Sox, the culture of honesty returning is about as likely as a winning season. From the start, Bobby Valentine had no chance. This should've been obvious. Francona left beloved to the players, a scapegoat for a wretched September. Lucchino wanted Valentine to change the culture – to be different, like different meant right. He was different, yes, supposedly an authoritarian, certainly a meddler, master manipulator and provocateur. Throw that into a clubhouse of territorial alpha dogs, Francona loyalists and those wounded by last September, and it's a Molotov cocktail of a hire. During spring training, ownership talked about the energy Valentine brought and the collaborative efforts to rekindle the championship Red Sox. Even from the first day, when he circled the Red Sox's spring training complex like he was getting paid by the step, players wondered if all the movement was false hustle and all the talk bluster. The smell of Valentine's b.s. was evident on Day 1. Whether it's the players' place to judge Valentine or not is immaterial, because it has happened and continues to. No matter how resolute Henry is, the players cannot look past a simple personality trait: Valentine treats players with general contempt. He always has. Genuflect to his brilliance or draw his ire. Such is the way of Bobby V.
The pile of misdeeds has turned into a landfill. When Valentine showed up late for a game this past week, it made news. Actually, it wasn't the first time. Players have complained about his tardiness before. His tactical brilliance? They don't see it. His mind games? Signs of desperation. You know, Larry Lucchino was right. 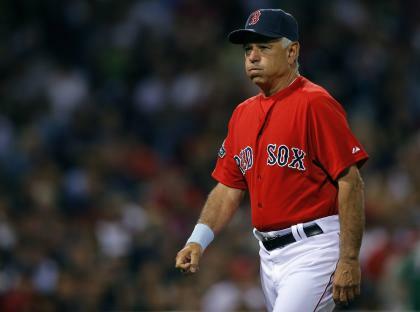 Bobby Valentine and Terry Francona are nothing alike. And perhaps the biggest difference is this: Valentine isn't anywhere near as good a manager as Francona. Most of a modern-day manager's job is ensuring the stability of a clubhouse, massaging and managing egos and personalities and conflict. Managers will win and lose games with strategy. Lucchino wasn't going for that with Valentine. He wanted the bad guy. He wanted to show the Red Sox how good they had it with Francona, how underachieving miscreants could use a disciplinarian, like these grown men, no matter how flawed, were nothing more than a bunch of fourth-graders who wouldn't stop shooting spitballs. The Red Sox are 62-74, one game ahead of last-place Toronto in the AL East. They have lost seven straight games and 23 of 32. In Boston's last 32 games last season, the ones that got Francona fired, they at least managed to win 10 games. Maybe that's the problem with this year's team. They're not eating enough Popeye's or drinking enough Bud Light. 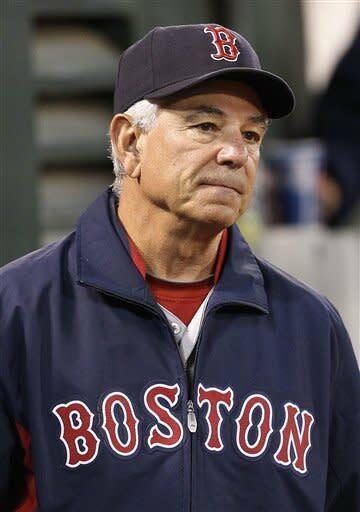 Bobby Valentine lost this Red Sox team long ago, well before they were the baseball equivalent of a crime scene. It says something about him, actually, that it took this many months for him to break down – that he still believed in himself when nobody else sharing his uniform did, or that hope was only a long winning streak away, or that his team understanding his ways and his reasons was an eventuality, not an impossibility. The sadness in his voice and language following the finale of the $55 million Oakland A's sweeping Boston in embarrassing fashion over the weekend belonged to a man who finally understood the enormity of his miscalculation. Somehow, for months, Valentine had come to work with this truth: the vast majority of his clubhouse straight-up disliked him, and the rest of the players didn't respect him. The depth of his denial, or the power of his belief in his own ability, is in hindsight staggering. Valentine has been around long enough to understand players can coalesce around a manager they don't like. This team had done the opposite. The manager served as the focus of mutiny instead of the rallying point. The underachieving, the injuries – they were all part of this, sure, but anybody who has been in a poisonous workplace understands the unease that permeates daily existence and how it affects the quality of work. Baseball players are not immune to that. Just as a great clubhouse can imbue a team with success, a toxic one can inure it with failure. For a franchise with a history of colossal blunders – trading Babe Ruth, letting groundballs squirt between the wickets, jettisoning Roger Clemens – the hiring of Bobby Valentine joins their Mount Rushmore of whammies. It is an experiment that didn't just go awry; its collateral damage included one of the biggest trades in major league history, the $250 million salary dump of Adrian Gonzalez, Carl Crawford and Josh Beckett to the Los Angeles Dodgers that doesn't happen if the Red Sox are even respectable. If Valentine has been good for anything, it's allowing Boston to hit the reset button without a scintilla of public bellyaching. That, and showing the Red Sox the sort of manager they don't need. "What difference does it make?" Valentine said when someone asked how he felt after the embarrassment in Oakland. Reporters described Valentine as "despondent," "almost whispering," uttering his words "softly" and "quietly." This was his moment of surrender to the inertia of the season. He emptied his bag of tricks. And whether his players, their performances or a combination of the two betrayed him, not even Bobby V possessed the sort of black magic necessary to right this franchise gone wrong. Ownership can stand by him, resolute as it wants to be publicly, but it must understand, for the sake of this franchise: The jig is up. Getting rid of Kelly Shoppach and trading Gonzalez and firing Bob McClure and giving votes of confidence cannot bury a truth John Henry no longer can extract from his players: Bobby Valentine does not fit this team, and it's easier and more pragmatic to get rid of one man rather than 25. If the Red Sox insist on keeping Valentine to oversee the mercy killing, so be it. For the health of their organization, the charade cannot continue into 2013. The best franchise in baseball half a decade ago is broken, much of it because ownership went against better judgment in search of someone who would provide … differences. Funny that the man tasked with doing so, Bobby Valentine, six months later uttered the words that will come to define his time in Boston: "What difference does it make?" None, it turns out. None at all.